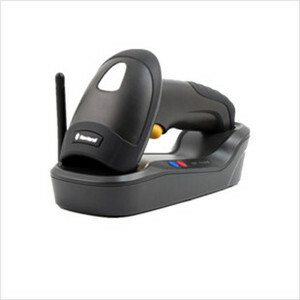 HR1550-CE 1D hand-held bar code scanner is the cordless model of HR15 series, which is also able to read PDF417 and MicroPDF 417 stacked 2D barcode. This model adopts Zigbee technology to realize wireless communication and supports standard RS-232 / USB. With good performance, this rugged scanner is very suitable for applications in supermarkets, shopping malls and warehouse environment application, etc. The state-of-the-art UIMG technology gives the HR1550-CE an edge with unrivaled decoding capabilities on all mainstream 1D symbologies as well as PDF417 and Micro PDF 417. This productivity-enhancing scanner offers up to 17 hours of battery life/ powers 60,000 scans, per full charge. The use of Zigbee technology promises outstanding user experiences—up to 50m communication distance and easy networking to expand it, and three operating modes supported. The NLS-HR15 is built into an IP54-sealed and drop resistant (1.5m) housing to withstand various harsh environments. Manufacturing, warehousing, logistics, retailchains, express delivery services, food traceability, electricity meter reading,inventory counting, healthcare. Code 128, EAN-13, EAN-8, Code39, UPC-A, UPC-E, Codabar, Interleaved 2 of 5, ISBN, Code 93, UCC/EAN-128, GS1 Databar, PDF417 (max. 255 bytes), MicroPDF417 (max. 255 bytes), etc.